Fernando Alonso is to leave Formula One at the end of the season, McLaren have confirmed. 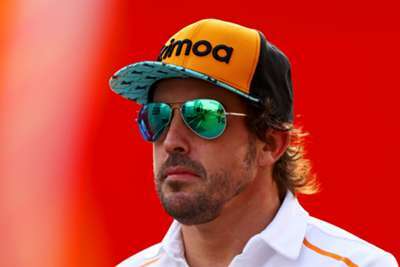 Alonso, whose McLaren contract runs out at the end of this season, has cut a frustrated figure in recent years with the team unable to provide the talented Spaniard with a car capable of competing at the top end of the grid. Before Tuesday's announcement, Alonso had been linked with Red Bull or a return to Ferrari, but he has also been heavily tipped to race in IndyCar having previously appeared in the series. While confirming that he will not race in F1 next season, Alonso seemingly did not fully close the door on a future return. He added: "I want to thank everyone at McLaren. My heart is with the team forever. "I know they will come back stronger and better in the future and it could be the right moment for me to be back in the series; that would make me really happy. A move to IndyCar would make the most sense in terms of Alonso's ambitions to complete motorsport's triple crown. Victories at the Monaco Grand Prix and Le Mans 24 Hours means he has two of those three legs, leaving just the Indianapolis 500 – which he raced in 2017 - to check off the list. Alonso's first drive in F1 came with Minardi, before he was later promoted to a race seat at Renault after impressing as a test driver. After winning his two world titles with the team, Alonso joined McLaren in 2007 but a difficult working relationship with Lewis Hamilton led to a return to Renault just a year later. Ferrari came calling in 2010 but he failed to win a another world title, finishing runner-up on three occasions before starting his second stint with McLaren in 2015, only for problems with their Honda engine partnership to end any hopes of him being competitive.